Switchgear enclosures are of self-supporting type and are made-up of 2mm sheet steel. Load bearing members are of 2.5/3mm sheets. Fabrication of sheet components is done using CNC and NC machines. Fabricated components are powder coated or zinc plated for surface protection. The freestanding functional units are extensible type. Power components like circuit breaker, voltage transformers, current transformers and busbars are installed in separate compartment providing service continuity class LSC2A as per IEC62271-200. Metallic partitions are provided to segregate compartments. Busbar, circuit breaker and cable termination compartment are designed for internal arc protection. LV control and protection apparatus are mounted in separate compartment installed on front side of switchgear panel. 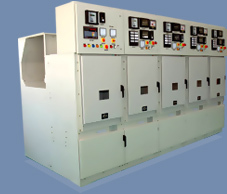 OHM Energy switchgears are compatible with modern relays and monitoring equipment. OHM Energy assures quality of all its product and services.